For Ma Baglamukhi Mantra Diksha, Sadhana Guidance email to [email protected] or call on +91-9540674788 ( Shri Yogeshwaranand Ji). It has been said about Ma Baglamukhi that if an aspirant meditates on her lotus feet only one time, his all the sins are removed at once, if one meditates two times his all the disasters are ruined without any delay and the person who meditates three times at her lotus feet his all the impossible tasks turn into possibility. I have never seen a moment in my life when I had to asked her for any particular desire till then I have come to her shelter. Ma Baglamukhi is the source of all Knowledge. She is both the source of delusion, and also the release from that delusion. She is the foundation and supporter of our known universe, and of all invisible universes. 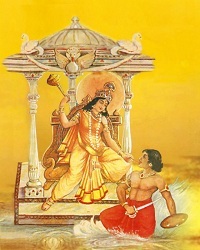 She is called Â“Stambhan-ShaktiÂ” due to Her restrictive power. She has the power to restrain every person or thing which stands against her child. The text Mantra-Maharnav says “The mantra of the goddess Bagalamukhi has the power of the Divine weapon Brahmastra instilled in it and the goddess simply strikes terror in and paralyze the enemies of her devotees. Repetition of her mantra is enough to stop even a terrible tempest. Mother Baglamukhi is known as the Ultimate Power, having “atomic” capabilities to destroy opposition. This cosmic power, along with its compliment Lord Eka Vaktra Maha Rudra (Mritunjaya) rules over the planet Mars, which is responsible for courage, valor and adventure. “Adventure” in this context stands for protection against evil, and especially those forces ruled by Mars i.e. soldiers, police, and so forth. The tantrik utilizes Baglamukhi Mahashakti to prevail over litigation, overcome enemies, and achieve stability in Life. Dangerous animals, anti-social elements and even gangsters can be controlled by the proper utilization of this Mahavidya. Further, this Mahashakti is an aspect of “Shri kul” which is known as the left hand of Lord Vishnu. So in that sense She is like the Goddess Luxmi (the goddess of wealth and spouse of Lord Vishnu). This shakti (power) is the helper of ‘Parbrahma’(supreme power of the universe) &amp; controller of the speech, movement and knowledge. So please don’t regard her as merely a deity of destruction, but rather understand Her as a power of ‘parbrahma’, or ‘brahmashakti’, who takes everything according to the Divine Law. She can accomplish anything, but is never unfair or unjust. If you are on the wrong path, if you are unjust or harmful to the society to which you belong, you will never achieve success in your sadhana. So first, strive to be compassionate and direct your efforts towards the good for humanity. The Power is not to be used for selfish purposes. The field of Spirituality is very vast. It is an ocean without shores. If an aspirant is to accomplish his aim, he should first select a Guru (teacher), because it is only the Guru who can carry you on the right and easy path. But the selection of a guru is very difficult undertaking, just as for a Guru – getting a good disciple is a true boon. To have a good guru is the best blessing, but to be a good disciple is really rare. So if you want to be blessed with a good guru, strive to become a good disciple.